Gyms are great for your fitness goals, but they’re one-size-fits-all. Why pay for a pricey membership at a crowded gym when you could have a smart home gym of your very own? Gym hours (not to mention group classes) almost never seem to fit your schedule perfectly. If you’re a working adult or a parent, you know how hard it is to squeeze in 30 minutes of exercise each day, let alone find childcare. A home gym gives you the flexibility to work out when you find the time – without worrying about childcare, busy schedules, or missing a delivery at home. And when you add in smart technology that enables you to answer the doorbell, adjust your thermostat, preheat the oven or change your workout mood with just your voice – you’ll never have to worry about interrupting your workout. Whether you want a dedicated home gym or only have room for designated space to roll out your yoga mat, there are endless audio, lighting, climate control and even voice control solutions to help you create the ultimate, immersive experience required to motivate you through your workouts. Whether you’re a yogi looking for natural light and calming audio, or need blackout shades, streaming capability and your favorite high-powered playlist for your early-morning spinning class, you can have the gym that inspires you to reach your fitness goals. If you’ve been dreaming of your own smart home gym for, we’re here to help. Whether you want a decked-out, dedicated space or need just a few pieces to get you started, we have the pros and the resources to help you create an immersive workout experience. Join us at BUILDEX this week! You’ll find us in the Greater Vancouver Home Builders Association Pavilion (HAVAN 431). We’ll share the latest in smart home automation, outdoor audio and video solutions, home theater design and the art of technology! See you at the show! For more on the show, visit BUILDEXVancouver. Like to schedule a time to meet? Please call or contact Mike Chorney at mchorney@lascala.ca. 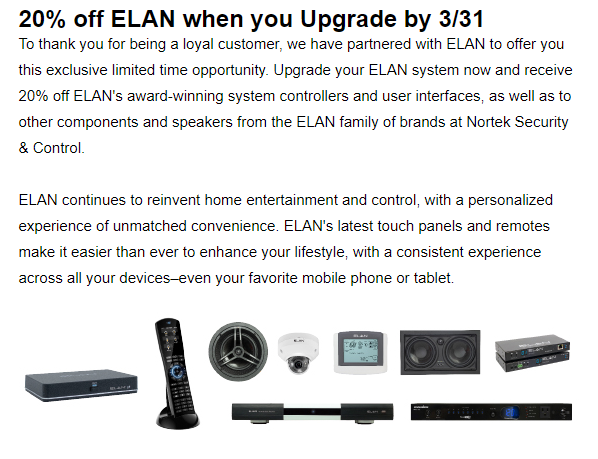 Elan clients, it’s time to upgrade! Call us today to schedule your consultation. Builders: we’re sure you’ve seen your fair share of home design trends come and go – whether it’s a popcorn ceiling or granite overload, there’s always something new. Our latest trend, though, is something that’s probably more the new norm – building smart homes. Increasingly, new home buyers are looking for the convenience, functionality and accessibility of smart home technology – whether that’s an all-encompassing high-end system or a few key pieces. Having the ability to integrate smart tech throughout the home with professional systems like Crestron, Savant and Elan or more a-la-carte versions like Amazon or Google, will definitely appeal to your buyers. These buyers want voice control, customizable settings and the ability to set “moods” for climate control, lighting and more; they want technology that is functional but can also easily blend into their decor – whether that’s having a centerpiece like a television that doubles as artwork or a statement mirror, or a system that blends seamlessly into the background, like built-in speakers and hidden wires. By incorporating this tech early in the building process, you can provide a home designed with the necessary infrastructure to add on to as technology and needs change throughout the life of the home. Whether at home or on vacation, every homeowner wants to be sure their home, family and belongings are safe. With ample technology available to keep your home safe, including cameras, smart door locks, window sensors and other features, you’ll want the infrastructure in place. These features aren’t “add-ons” anymore – they’re part of the standard package. You’ll keep the installers and your buyers happy if you’re able to plan ahead in the design for this highly-desired and necessary feature. Your buyers probably know how an Echo works and might even already have a DIY system in place at home. But when building their dream home, there’s so much more to consider! Make sure your model is outfitted with your standard smart home package – and then some. In using your model as a smart tech showroom, you’ll be opening them up to a world of design possibilities that add even more customization and personal touch to their home. Consider an all-encompassing security system, a whole-home audio system, as well as lighting and shade control that can be customized based on the time of day, their mood, and so on. Having an impressive smart home as your “base model” means you’ll be setting yourself apart from the competition – and that’s sure to get any buyer’s attention. We have the resources and the pros to help you implement smart technology into your build – whether you’re the builder or in the market to buy a home for yourself. We can help with everything from design, to training staff and your buyers, to connecting you with other tech-savvy home builders. Give us a call today! Smart technology and children are often synonymous with smartphones, tablets, and other ways to keep them entertained. What some people don’t realize are the safety and everyday living benefits of having smart homes designed with kids in mind. Your priority is protecting your kids, especially when any technology is concerned. It’s no longer uncommon for kids to come home from school to an empty house, but now you have the capability to keep an eye on them and make sure they’ve gotten home safely even when you’re at work or running errands. Give yourself some peace of mind by equipping your home with door and window sensors that let you know when your child has arrived home safely, or a smart lock that gives you the ability to let them in when they’ve misplaced their key. If you’d like even more functionality, consider integrating cameras with two-way communication abilities to greet your family as they get home, or even keep intruders away. For added security and accessibility, consider keeping this control in the palm of your hand on your smartphone so that you can always let in the babysitter, make sure your oldest made it in for curfew, or discourage unwanted visitors from trying to enter your home. We all know blackout shades and lighting control help with everyday things like movie-watching and energy-saving, and it’s no secret that lighting and shade control can help keep intruders away, but have you considered the impact light has on your daily routine? Imagine integrating lighting and shade control into your home that will help with signaling that it’s time to get in bed or wind down with a book. You can even set custom settings for the smallest members of your family to help ease that fear of the dark or for a little extra help in the morning when they can’t get up with an alarm. We can help you optimize your home and network capability for gaming, family gatherings, and personalized settings for everyone in your home. By setting up a VPN, firewalls, and parental controls, you can keep them safe, while also giving them the ability to stream their favorite music or watch a movie while their friends are over. We’re here to help, and we’re kid-friendly! We have the expertise to help you integrate the right kid-friendly smart technology into your home. 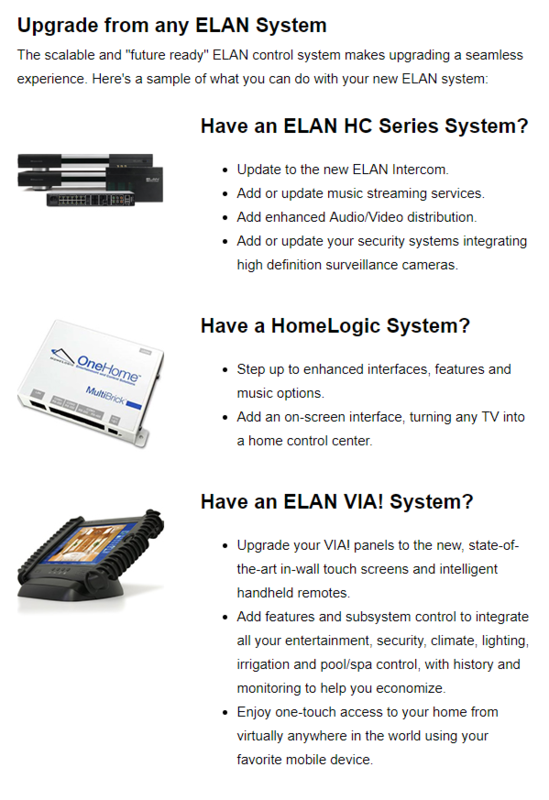 Let us help you configure your home with the best technology for your family’s needs. We all know there’s no place like home for the holidays, but the reality is a lot of us have to travel. While leaving your home behind can be a stressful part of the season, we’re here to help incorporate smart technology into your home to keep it and your belongings safe while you’re away. How “secure” is your security system? The best defense against intruders and other dangers is a security system. Whether you’ve already installed a system or you’re still looking for the right fit, we can help you figure out the best security system to help defend your home. There are endless options to amp up your security – from digital doorbells and locks, to round-the-clock monitoring. Whether you want all the bells and whistles or just the bare essentials, the right tech can help you make sure your belongings are safe! This doesn’t mean leave all your lights on while you’re gone, though! Using lighting and shade control to your advantage by setting “scenes” based off the time of day make it look like you’re home, which is an excellent deterrent for unwanted visitors. By incorporating dynamic lighting and shade settings, it will look like you never left home. What’s more, proper lighting and shade control can help you save on energy costs at home or away! All of this smart tech can’t be used to the best of its ability if you’re not able to monitor your home from your mobile device, so make sure you have the best apps to keep you connected to your home! By having the right connectivity, you’ll be able to check if the thermostat is properly set, the doors are locked, your kitchen appliances are off, and chat with whoever just rang the doorbell. Staying connected to your home will give you peace of mind while you’re away for the holidays. Consult a professional integrator when considering new safety or smart home tech to make sure you’re getting the best tech to suit your needs and that your features are compatible! Whether you already have the basics or you’re just starting to look, our knowledgeable team of experts at La Scala can help you. Whenever you think about the holidays, you probably think about presents or twinkle lights. Maybe you think about friends and family around the table, enjoying a meal and each other’s company – or maybe you just can’t wait for pie! The reality, though, is that you’re probably spending a lot more time in the kitchen. Thankfully, there’s new tech available to help you make sure you don’t miss out on any of the festivities. Your kitchen is one of the most personal, necessary rooms in your entire home and it’s worth taking the extra time to personalize it with the right functionality to fit your lifestyle. Entertainment features like built-in audio or video screens, smart appliances and voice-controlled smart home automation like Josh.ai give you the opportunity to personalize your kitchen to suit your needs for not only everyday living, but for special entertaining, too. There are countless options currently available for smart appliances like refrigerators, ovens and “hubs” like Josh.ai, Google Home, or Amazon’s Echo. And while these might seem a little frivolous at first, it’s worth taking time to consider the added convenience of having them in your home. Having an app connected to your oven means you don’t have to miss the football game or your favorite holiday movie, and that smart refrigerator can text you a picture of your refrigerator’s contents and save you from a second trip to the store. Connect these smart appliances with a hub like Josh, and you’ve got an extra set of hands in the kitchen even when you’re not at home! With hectic schedules, guests on their way and a lot on your plate, you wouldn’t be the first to forget to turn off the stove, turn off the lights or feel like you need to be in two places at once. By incorporating the right smart technologies, you can maximize safety AND convenience in your kitchen. Your stove and oven can now warn you that they’ve been left on – instead of hearing the news from your smoke detector (or worse). You can also increase your energy efficiencies with smart appliances, which helps the planet and your wallet. If a smart kitchen sounds like the right solution for your family this holiday season, let us help! We’re here to guide you through the best smart technologies for you and your home. As the trend toward multi-dwelling units, MDU, continues to grow along with booming city populations, the desire for more exclusive, luxurious and high-tech living also increases. Whether you’re designing, building or buying, this level of modern luxury is customizable and affordable. The best way to plan for a smart MDU is in the blueprints. Strategically place your outlets, structure all the wiring and optimize connectivity for the best internet connection possible so that your residents will always have the convenience and automation they desire, without sacrificing their design style. Thoughtful placement allows for minimal interior design disruptions. Wiring before the walls go up and considering features like built-in speakers, storage for entertainment features or a whole-home control center at the front door, ensures that design and convenience stay a crucial design element, without having to worry about unsightly wires or bulky equipment getting in the way. When you look for a new home – whether it’s an apartment, condo, or multi-family residence – you want it to feel like home. There’s no better way to accomplish that than by making sure your MDU comes with a smart home system that can be personalized to suit your lifestyle. 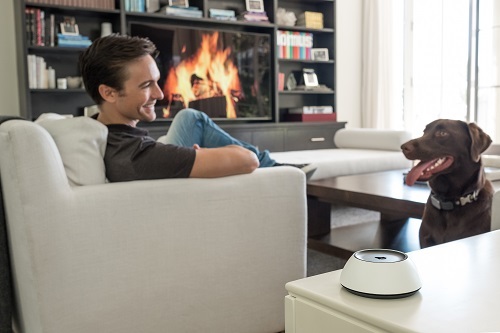 Custom climate control, security features and entertainment systems with personalized moods can transform your space with just the sound of your voice, while still keeping you super-connected. Convenience, connectivity and energy efficiency are at the top of any buyer’s must-have list, but incorporating smart home technologies like climate control, automated shade and lighting controls means you can also improve your energy efficiencies whether you’re at home or away – and that’s just as important for the resident as it is the owner of the building. Now, residents can know what’s happening in their homes, while it’s happening, because some systems can even alert residents and building staff about potential fire and water damage before they become a big problem. Smart home automation also offers endless options that increase safety – from cameras at the entry points, to smart locks, to timed settings for your shades and lights – that protect the building and its residents inside. Connectivity to the concierge desk and any entry points so that you’re only a touch away from communicating with staff and visitors, as well as round-the-clock monitoring ensure your safety and comfort. All of these features are even more attractive when you connect them to your smartphone or tablet. If you’ve been thinking about building an MDU, or currently live in one and want to improve, talk to us today! We can help you design the perfect system for your needs. Everyone enjoys music. Whether you’re a fan of classic jazz, old school R&B, heavy metal or like to keep up with today’s hits, listening to your favorite songs should be always be an experience. Why, then, is home audio not as much of a consideration in most home entertainment systems? It seems like home theater systems have become a norm in most homes because of the entertainment value you can get out of your television or big screen projector. But just like speaker placement and configuration are crucial for creating an immersive surround sound experience for maximum entertainment value, your music library deserves the same respect! Speaker type, placement and system configuration are crucial to ensuring you can wrap yourself in the sound. Another important factor to consider when implementing any sort of home audio system into your space is the media type of your entertainment. Have you gone completely digital where all your media is streamed, or do you like to keep it old school with physical media like classic vinyl and your record player from high school? Each form of media require different systems to ensure you’re listening to the music as it was intended, while also allowing you complete access to your favorite artists. For instance, do you need a high-tech touch panel display that gives you access to an unlimited library connected throughout your entire home? Or do you need a dedicated listening room? The key is to optimize all of your spaces for the best listening experience possible, which means carrying that sound system throughout your home, as well as potentially outside. Integrating a home audio system throughout your home is great for entertaining just as much as it is for everyday listening. With a whole-home audio system, there’s no reason why a regular dinner can’t be as fun as a holiday party. This stunning waterfront residence earned three of the custom electronic design industry’s most prestigious awards: Best Integrated Home, Technology Meets Design and Life Lived Best at Home. The “Technology Meets Design” award celebrates the best integration of technology that complements the design scheme for the room or home. The judges, drawn from the architecture and interior design community, were looking for a project that showed a successful working partnership with the integrator and design and build industry partners and our relationship with Vancouver’s Aaron MacKenzie-Moore Design was nothing short of exemplary. The homeowners love to entertain but made it clear that the interior look and quality of finish must not be compromised with the introduction of technology. Sound was expected in all rooms of the home but not seen. Invisible speakers were used in 16 zones which included all three guest suites, hallways, closets, laundry room, and invisible subwoofers rounding out the sound in the family room. The media room is a non-traditional room that is also used as a reading lounge that overlooks the beach. Soft furniture, motorized roller shades, and heavy fabric curtains were included to soften the hard surfaces and increase the acoustic opportunities, as well as to block out the ambient light coming from the beach-front windows. Having won in the “Best Integrated Home” and “Technology Meets Design” categories, the judges sought a winner for the “Life Lived Best at Home” designation. Beyond the technology and aesthetic design considerations, the judges now were looking for a “residence that used technology to maximize and enhance the client’s lifestyle, providing functionality, safety, entertainment, convenience, aesthetics, and efficiency.” Not only did this project incorporate the technology beautifully into the home’s design, but the judges agreed that it encompassed the homeowner’s desires, considerable enhancing their lifestyles. A scene called “Movie Night” on the control system, which softens the media room by dimming the lights, rolling down the shades, and drawing the curtains while turning on the media room components. A single button solution puts the home into “Entertain” mode. The system needed to be flexible, so the homeowner could make minor scene adjustments without the need of a programmer or site visit. We offer a few control solutions, but the feature of using real pictures of the home to navigate the control system was very appealing for our clients. The Savant system provided this option. The team at La Scala is extremely pleased with the project outcome and proud of the recognition received. Please contact us to learn more and visit the links below to view the project gallery and read about the additional accolades yet to be won for this gorgeous waterfront home. What comes to mind when you think about a smart home? You probably didn’t imagine a sleek, high-tech smart bathroom. It’s easy to want the best and newest technology and design for all your living and entertaining spaces, but what about the rooms you actually live in? Most homeowners place such an emphasis on their living spaces – only considering those in which they entertain guests – that they forget about just how much time they spend living in their bathrooms. So why haven’t you made your bathroom just as smart as the rest of your home? It’s probably the first place you go when you wake up and the last place you go before crawling into bed. You pamper yourself here, you prepare for the day here – not to mention the necessary nature of it in the first place. And if you’re at all concerned about resale value down the road, all signs point to futuristic bathrooms making their way into everyday homes. Technology exists for every purpose and place in your home – including your bathroom. Whether you want a television mounted by the bathtub so you can watch your favorite movies, piped-in audio so you can perform a concert in your shower, or a smart mirror to keep your life at your fingertips, consider turning your bathroom into the place you love to live in most. Consider the added comfort of connecting the smart home control you already have in the rest of your home to your bathroom. Control your thermostat, dim the lights and still have access to your security system so that winding down from the day is just as relaxing as it is necessary. By incorporating the right features into your bathroom, you can create an oasis out of something that used to be seen as utility. Regardless of how futuristic or minimalistic you’d like your bathroom to be, the pros are here to make sure it’s just as smart as the rest of your home. Need more inspiration for bathroom tech and design before you start? Check out this handy guide to some of 2018’s trends. So you want a smart home, but you’re not sure how to integrate all of the technology you want into the design style you have. Lucky for you, technology doesn’t have to be a hindrance to your style anymore. Instead, choose technology that stands out and doubles as artwork or has the ability to blend seamlessly in so that you won’t even realize it’s there. Think about the way your living spaces are currently configured. There’s a good chance your furniture centers around the television. But what about that space when your television is off? You’re left with a black, blank rectangle on the wall – and that’s a missed opportunity. Consider adding a television that easily doubles as your own personal art gallery, with paintings or photography you can change as you wish, that matches your style and mood perfectly. You can even use your own photographs to add a personal touch to your living space to make your technology work for you, even when it’s off. What’s more, these televisions can be fitted into the wall for a seamless look or come beautifully framed, ensuring your television fits the design, and not the other way around. And it doesn’t stop with just television screens. Adding a smart mirror (or a few) to your home is an excellent way to add connectivity to your smart home without compromising style or practicality. Imagine a customizable dashboard complete with weather, social media updates, your calendar – even voice-control of your home’s systems – all from your bathroom mirror. Smart mirrors allow the perfect mix of entertainment, organization and functionality, while also coming in designs that are sure to enhance your space. Whether you’d like to start from scratch and include a technology integrator from the beginning of your design plan, or need help updating your current living spaces but aren’t sure how to do it without compromising design, consult La Scala Integrated Media to make sure you’re getting the best tech for your lifestyle and interior design. Is Your Home Ready for Guests? Summer is in full-swing and the holidays inevitably are approaching. Before you know it you’ll likely be hosting an out-of-town guest or two. You might be ready for visitors – but is your home? Whether it’s a party that requires a reliable system to impress and keep your guests entertained or some in-laws visiting that could benefit from more intuitive controls, there’s a lot to consider! If you haven’t thought about your home’s technology in a while, now might be a good time. Upgrades to your home automation can ensure your systems are working seamlessly in time for your guests. You might have mastered your control panel, but will your guests be able to figure out how to turn the lights on and off and adjust the thermostat before they go to bed? Is your lighting control is a bank of switches at the front door or are your shades on a separate remote? Talk to us about integrating your systems and simplifying control. It’s crucial to make sure your controls are easy enough for your guests to understand. Maybe you already have all the right home automation tech in place. However, when was the last time you checked your service plan? Having a proactive service plan for your home automation system from a knowledgeable integrator like La Scala helps ensure you’ll always be up and running. We’ll be alerted before any potential problems arise. While you’re at it, don’t forget to check your network and make sure it’s robust enough to handle streaming on all your guests’ devices. Regardless of whether you’re entertaining a few or dozens, for a night or a week, make sure you have the right smart home technology and the best service plan in place. Both you and your guests will be comfortable and thoroughly entertained. Smart home technology might make you think of temperature, automated lighting and shade control, voice-control entertainment and security. What you might not realize is that this technology can extend into your wine collection. Gone are the days of having your wine unprotected and at the wrong temperature or worrying about a power outage at home while trekking across Europe. There are numerous options for any level of connoisseur and any size collection. New technology from the standard cooler to a fully-equipped cellar, complete with the accessibility and organization at your fingertips thanks to state-of-the-art smart home technology and apps, makes this investment an excellent one for your home. These systems have many benefits, the most important being their ability to connect with your existing home automation technology. Motorized shades, lighting and audio aren’t just for your living areas anymore – you can utilize your smart home tech to play your favorite music, control the temperature, adjust the lighting and protect your cellar from unauthorized guests. For those with serious collections, many systems offer monitoring of your inventory, so you know what bottle has been accessed, by whom and when. High-tech options like the Elertus Wine Protection System or the IWG Cellar Cerveau offer your collection protection from humidity, temperature changes and power outages. Systems like the Cellar Cerveau and eSommelier come equipped with label recognition software and RFID label technology to help you track your inventory – down to where the bottle is in your cellar and what your collection is worth. What’s more, some systems come pre-configured with an expansive listing of data like wine types, grape varieties and tasting notes, while others can also offer suggestions for new additions. Whether you’re just starting your collection or have been an oenophile for decades, consider the value of automating your wine cellar. La Scala has been privileged to work with some of Vancouver’s finest designers to integrate these features into our clients’ cellars and would welcome the opportunity to work with you and your design team. Need a little inspiration? Check out these five luxury homes featuring next-level cellars with automated controls. Can’t wait? Give us a call and let’s get started! It’s simple, really. It’s about making your everyday tasks easier and making the complex simple. Some think home technology is purely luxury. Well, that depends on your definition. Home automation is exactly that; it automates features in your home. Those features may include your lights, window treatment, smart door locks, climate, garage door, security features and more. It makes them work together as one. Sure, it’s a nice to pull up in front of your home late at night and, right from your phone, be able to activate a welcome scene that lights your path and home’s interior while unlocking the door. But it also helps to keep you safe. And imagine if faced with a fire or medical emergency – first responders could easily identify the home with the flashing entry lights. With this technology available, doesn’t it just make sense? And let’s consider efficiencies of saving energy, time and money. Imagine occupancy sensors that turn off the lights in an empty room and motorized shades that raise and lower to either take advantage of the sun’s warmth to light and heat your home or block it out when the heat is intense. Lighting control with pre-set scenes of slightly dimmed lights also yield savings, while adding ambiance and convenience. As a parent, home automation offers peace-of-mind. You can get an alert when your teen makes it home safely or remotely open the door when the need arises. As a caregiver, simple automated features, accessed by voice control, can keep an aging loved one in their home longer while sensors can let you know if they’re out of bed and have opened the medicine cabinet. In this fast-paced world, why not simplify where it makes sense and make your everyday a little easier? Free up some time to enjoy the true luxuries, like extra time with friends and family. Call us today and let’s explore how we can make your everyday easy. 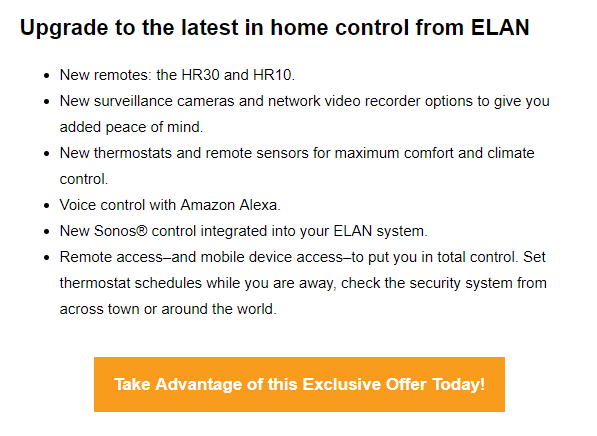 You’ve automated your entire home. Your new, smarter home—outfitted by your professional technologies integrator—is complete with all of the control systems necessary to keep your home in check. But how do you plan to keep it all connected? Meet your home’s new interface, Josh. Josh.ai is a luxury voice control system, designed to work with your professionally-installed home automation. Leading the industry in Natural Language Processing and complete with machine-learning to adapt to you and your preferences, Josh is easy to use. When properly installed by a professional integrator, Josh ensures the best home automation experience. Josh.ai is “artificial intelligence as unique as the home it runs,” and serves as a whole-home processor, connecting with all of the devices in your network, from pre-existing control systems like Crestron and Lutron. The interface, designed to fit the aesthetic of any room, can go anywhere and do anything you want in your home. Its touch-sensitive surface works to control event triggers like mood lighting or volume control — a feature only outdone by its intelligent voice control and ability to understand natural language. Josh can help you control the temperature, humidity and lighting in your home to make your home even smarter. Its sensors can tell which room you’re in and can adapt its functions using its contextual awareness. Josh allows you to make your home automation smarter, without even needing to physically interact with it. If you’re serious about automating your home and making your professional installation work for you, Josh could be the “holistic interface” you need. Are you part of the 25 percent of people who own some kind of smart home product? If you’re not, you’ve probably at least heard about Amazon’s Alexa, if not seen its latest Super Bowl commercial. What you might not have heard is that smart home technology is taking the real estate industry by storm. In fact, artificial intelligence and other smart home technology can actually increase the resale value of most homes – an important factor to consider now that more and more Millennials are buying homes and interested in smart, connected devices. This trend makes sense. Smart home technology can increase energy efficiency, saving homeowners money on utility bills, while also providing eco-friendly perks. Combine money-saving with the added convenience of controlling your thermostat and connecting all of your media, to the safety and security of keyless entry, video doorbells and 24/7 monitoring, and it’s no wonder why so many homeowners are investing in this tech and making the switch to a smarter home. Houzz also reported an increase in the desire for smart technology integration amongst home buyers, especially first-time buyers, in their 2017 Houzz and Home renovation overview. This came along with an increase in “green” energy and material trends, as well as improving the functionality of a home and alleviating health concerns, which can also all be addressed with the right smart technology. In a culture where people are busy and constantly connected, more and more home buyers are prioritizing the connectivity and convenience offered by home automation, artificial intelligence and other smart technology systems. So whether you’re looking to buy your first home or sell one you’ve had for a while, consider the benefits of a fully-automated home. The choices in color, weave and design of window shades are anything but beige! We’ve been touting the benefits of automated window shades for years. They’re an elegant choice in window treatment and offer a variety of unique shading solutions across your home. They save energy. They filter glaring sunlight, adding comfort while protecting your furniture from fading. They can be programmed to simulate that your home is occupied, acting as a deterrent for would-be burglars. And the list goes on. But, as extensive as their features and attributes, are their exquisite array of color and fabric choices. Motorized window coverings can provide anywhere from minimal coverage to complete blackout. If you’re in need of multiple shading solutions, such as a sunny living room that transitions into a cozy, dark TV viewing area, dual roller systems are available, providing an option between the two. The level of sheerness is referred to as the “openness factor”, a ratio of the open space in the fabric. The denser the weave, the higher the light filtering properties. Sheer shades are typically measured in the 1% to 10% range while a blackout shade is at 100% for total blocking of light. A sheer shade filters glare while still allowing clear visibility to the outside. A translucent or dim-out fabric, on the other hand, can range from a low openness factor up to 95% but creates privacy by limiting the amount of detail seen through the weave. Blackout shades block all light and are perfect for home theaters and bedrooms. The weave, or pattern is also a consideration for both design detail and design requirements. Roller fabrics are commonly offered in basketweave, twill and jacquard weaves, each with a unique, directional pattern and manufactured in limited widths. If you have an expansive window opening, the fabric can be turned horizontally and pieced together. This is referred to as railroading. Factoring weight and pattern, certain fabrics lend themselves better to achieving these widths. We’ll guide you through it. One of the nicest features about custom motorized shades is that they can be programmed to stop at select intervals, lowering and raising them throughout the day. Not only does this allow you to take advantage of capturing or filtering daylight, but aesthetically, it enables the shades to rest at desired design features such as mullions or chair rails. Customization doesn’t stop there. Your shades can be programmed in harmony with your lights, music and more to create custom “scenes”. “Good Morning” may lower the shades 50% and brightly light the kitchen while “Good Night” closes the shades and softly illuminates your nighttime paths. 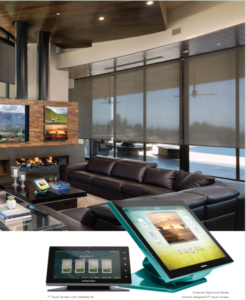 For specialized windows, wirelessly controlled shades are the ideal custom solution. Skylights, French doors and dramatic, impossible-to-reach, feature windows all benefit from the energy savings and privacy that motorized shades provide. And color? Check out the available color match solutions that allow you to pinpoint your pantone color or match the exact shade of a favored object! The selections and solutions are endless, so how do you determine the right openness factor, weave, color and control? Let’s set up an in-home consultation. If you’re working with an interior design professional, we’re happy to work together to design window coverings that will complement your décor, add value to your home and weave elegance into your automated lifestyle. Audio & Aesthetics. The Soundbar Solution. As the choices in mounting options for TVs grow, so do the challenges in speaker placement. Today’s thin, sleek, lightweight displays can be mounted just about anywhere; above the mantle or slim console, in a custom alcove or on a clean, open wall. So, where do you place the speakers? While in-walls offer an elegant solution, installing them is not always feasible. Enter the soundbar and its versatile installation and feature options. Many leading audio manufacturers offer a soundbar solution, an all-in-one speaker system that delivers high-quality audio without requiring the space of a home theater receiver and surround sound speaker system. Mounted or placed below your display, they offer exceptional sound and stunning design. A remarkable improvement to your TV’s speakers, the soundbar features a center channel and often a full LCR (left, center and right channels) experience. Some are designed to be paired with surround speakers and a subwoofer while others replicate full surround sound. Connectivity, control and quality are prevalent across today’s models, offering conveniences such as music streaming, wireless connectivity and simple IR learning for integrated control through your current remote. Touting exceptional performance, Triad has an extensive array of options ranging in size and capabilities. They offer micro and mini LCR’s as well as a micro 3-in-1 speaker designed for use with shallow flat-panel televisions. New to their line-up is their on-wall Mini LCR 3.0 SE (Special Edition), offering “unparalleled” performance with 3 separate audiophile speaker systems integrated into one sleek, acoustiperf-grilled package. An elegant choice, James Loudspeaker offers a variety of soundbar solutions. True to their brand, their line of soundbars is completely customizable and offered in an array of both standard and custom colors. The line-up includes an extensive variety of formats to suit client preferences and range from center channel, stereo bar, or complete LCR package. James’ soundbars are custom fit to the TV for seamless integration and elegant design. For added design versatility, they are available in vertical or horizontal configurations. And the sound, well, they raise the “bar”! Dolby Atmos has the sound “bar” even higher and a select few manufacturers have integrated the immersive technology into their soundbar line-up. Dolby Atmos “frees” sound from its channels for heightened impact by enabling finer control of individual sounds. Through strategically positioned speakers, sounds move around the listener from every dimension for an immersive, life-like experience. Samsung has this mastered. Paired with one its breathtaking 4K displays, Samsung delivers a seamless 4K Hi-Res Audio experience with its HW-K950 Soundbar speaker system. The system replicates cinema-style sound with 15 built-in speakers including 4 upward-firing drivers and rear wireless speakers for crystal-clear sound all around. On-wall or on console, wireless and Bluetooth, surround sound or Dolby Atmos, the choices are endless but all are great solutions for incredible audio and gorgeous design. Give us a call. We’ll help determine the best features and solutions for your overall system requirements, connectivity, control and space. We’re just beginning to realize the extensive benefits of home automation. For years, we’ve recognized the luxuries, conveniences, comforts and safety aspects of an integrated home, but we’re learning that those attributes are just the tip of the iceberg. Today’s smart home can aid the disabled, monit or the ill and enable our Vancouver residents the opportunity to stay in their homes longer. It wasn’t so long ago that baby monitors hit the market. We could breathe a sigh relief while carrying the walkie-talkie-like device around from room to room. And then…baby cams were introduced and suddenly we could watch over them day and night. Flash forward and now we can check in on our homes via our smart phones anytime and from anywhere. We appreciate the convenience and peace of mind that brings in terms of home security or even keeping watch of our pets, but imagine the comfort of being able to watch over an elderly parent. 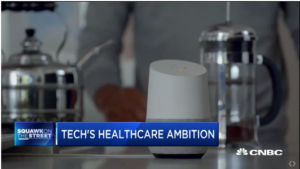 Modern healthcare is finding new, innovative ways to capitalize on our connected homes, allowing people to remain in comfortable, familiar surroundings longer. Automated, simple-to-use devices can remind an elderly person to take their medication or instruct an autistic individual how to prepare a meal. Caregivers can be alerted when an Alzheimer patient opens a door or when a diabetic’s glucose monitor sounds. 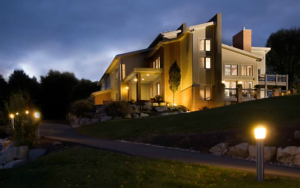 For an added measure of security, automated lighting can be triggered as well so that, in the event an audible alarm is missed, visual cues will wake the caregiver while lighting the way to their loved one. Visual prompts can also be life-enhancing for the hearing impaired and elderly. The more recent introduction of integrated voice control has opened up a whole new realm in home healthcare. Individuals that may otherwise be unable to physically or mentally operate a touch panel or control device can now gain control of appliances, entertainment and security devices, affording them independence. Home automation and, more specifically, voice-controlled devices also have a positive impact on our mental health. Multiple medical studies from various academics from Rutgers, Stanford, and University British Columbia have concluded that individuals who feel a greater sense of environmental control demonstrate increased persistence, motivation, and optimism, and have been shown to have lower risk for psychopathology. That research extends to a homeowner’s ability to be “in control” of their smart home, accessing features that reduce worry and, therefore, stress levels. The life-saving stories are many and we can each likely envision a scenario where remote monitoring, automated lighting, cameras, door locks and voice control can make ours and our family’s life easier, healthier and more gratifying. Innovative technologies continue to transform our lives. Home automation, once considered purely a luxury, has become a wonderful, life-changing tool and essential part of our daily lives. Healthcare, along with our homes, just gets smarter and smarter. According to a recent survey by Randstad, non-traditional workers (freelance, flex, remote employees) make up 30% of Canada’s workforce with 85% of them projecting a rise over the next 5 years. Similarly, projections estimate that by 2020 mobile workers will account for nearly three quarters (72.3%) of the total U.S. workforce. Mobile devices and simple, yet sophisticated, collaborative tools have enabled today’s workforce to effectively work from anywhere – an airplane, a hotel room or a well-appointed home office. Remote work is a boon to productivity and can lead to higher efficiency and lower turnover. Not only does it attract younger workers (Millennials highly value flexibility and technology), it keeps older workers in the workforce longer. So, the benefits are many but establishing a remote environment that represents the employer’s brand while providing a productive, collaborative space for the employee requires more than simply plugging in a laptop. The first step is to define the space. The design will be driven by the type of work performed, the equipment required and the available spaces within the home. The room should be a space separate from daily living areas, free from distractions that could potentially interfere with work or interrupt calls or video conferencing. It will need to offer adequate storage and easy accessibility to the home network. Color – Furnishings and walls should be ergonomically pleasing and conducive to extended use. Opt for neutral tones or soft, muted shades such as periwinkle blue, avoiding harsh, dark or vivid shades. Choose a matte finish over reflective glossy sheens. Wallpapers and fabric wallcoverings with subtle, non-reflective designs also work well. Backdrop – Consider the background when video conferencing. Keep the space clear of clutter and personal affects. Portable pop-up screens (plain or imprinted with the company logo), elegant room dividers and organized bookcases provide a professional backdrop and element of privacy. Acoustics – Create a quiet space. Carpeting, area rugs and upholstered furnishings help to manage reverberant noise. Acoustic treatments, including custom wall panels, also aid in noise absorption. Lighting – The more natural the lighting, the better the overall experience. Take advantage of natural sunlight by positioning the desk to face the window, avoiding shadows while on camera. For harsh, direct sunlight, add motorized window shades, available in various light-filtering, non-reflective weaves. If the room’s design is not conducive to proper desk placement and the light source is behind you, blackout shades can be added to properly control the light levels. Ceiling fans with lights create a strobing effect on camera and should be turned off. An integrated home automation system provides agile control of lighting, window shades, ceiling fans and HVAC, ideal for the working from home. A secure, stable and robust network connection is essential for reliable network connectivity and a quality conferencing experience. Hardwired broadband is recommended over wireless when possible. Also important to consider is the number of users in the home that are competing for bandwidth. Based on network capability and hardware compatibility, there are numerous platforms available for seamless collaboration. Implementing a few tools that enhance audio and video will afford an even better experience. Audio – Conferencing requires 2-way audio and can be problematic without the right equipment as devices can produce distortion and echo. Rather than relying on the laptop’s built-in speaker and microphone, opt for an external echo-cancelling speaker with mic for clear communication. In a reverberant environment, a headphone with built-in microphone will filter distracting background noise. Video – A high-performing, properly positioned camera is critical for effective collaboration. Invest in a high-quality auxiliary unit rather than using the built-in camera that restricts control and image resolution. The camera should be placed where the user is focused, just above the monitor’s content for a near-to-natural experience. This will simulate “looking” into the camera. Common mistakes include mounting the camera below the screen which produces an unnatural angle or mounting it on a monitor other than the one hosting the content, showing you looking away from the camera. Evaluate the quality of the experience by conducting trial runs. Most platforms offer the ability to record your meeting, giving you the opportunity to view the meeting as if on the far side. Record sessions using various scenarios – both while the room is quiet and when things from across the house are “active” – pets, HVAC, dishwasher, etc. Type on the keyboard to gauge the sound level of keyclicks, assess how the background looks and adjust camera position and lighting to simulate a face-to-face meeting. Getting started requires thoughtful design and know-how, but it’s an investment that will be realized through effective collaboration and increased productivity for years to come. As experts in both the technologies and design aspects of this rich, residential/professional hybrid environment, LaScala can help you with the infrastructure and hardware requirements and work with your interior design professional to create the ideal remote workplace. In this ever changing world that we live in, there is no escaping technology. Our personal world appears more and more to be enveloped by a device we call a “smart phone”, although more and more of the ‘phone’ use is being replaced by a myriad of ‘apps’, and other functions of the device. From capturing visual moments on the fly to directing us to our next destination, to telling us how to cook our favourite dishes, this device has come a long way since its inception over twenty five years ago. Today’s vehicles are also following suit in the technology game. Most new vehicles today don’t require a key to open the door or start the car, instead opting for a ‘fob’ device one can keep in one’s pocket or purse, and which transmits a signal notifying the vehicle that you are within its vicinity. More, the car will know that it’s actually ‘you’ that is near, and adjust the seats, mirror, and other features to your taste – automatically. Voice commands and other formerly futuristic features are now becoming commonplace in today’s vehicles as well. But what about your home? When most people arrive at their door, they pull out a device that was invented in the 1840’s – a tumbler lock key. Once inside, you feel around for the light switch, invented in 1884. You can probably guess where I’m going with this – the home hasn’t caught up with technology, or has it? While only 12% of homes currently might be considered ‘smart’, that figure is projected to double and triple over the next few years. Why? Because the technology is truly getting ‘smart’, and the price is way down. Much is being said about devices in your home being integrated and controlled by a singular control device. Be it shading, lights, temperature, security, locks, the pool/hot tub, and any number of other electronic devices, there are systems that will control them all, via a wall mounted or portable ipad or remotely through your ‘smart’ phone. But what about Automation? A True Smart Home should work for the home’s occupants, just like your car does. When you arrive home, your home should know it and act accordingly. You can have your system set up so that certain lights turn on at a pre-set time, the shades close, the temperature goes up, and even have the door unlock if the system sees that you are within feet of the door. You could also have one button programmed on your control device that says “Party”, amongst other feature sets. The lights in various areas could alight or dim, the music could begin to play from your favourite source in various specific areas of the house that you’ve previously chosen, and at a pre-set volume level. The gate could unlock for a specified timeframe to allow guests easy access. When you leave your home, press ‘goodbye’ and the security could engage, the shades could close, the music could turn off, the temperature could drop, and all the lights could turn off. If you’re away for an extended period, the lights (and other devices like music) could turn on and off based on your previous two weeks of use so it appears as if you’re home. The list of options is endless. Wake up options, going to sleep options, dinner party options, and more. This year will see a surge in Voice Activated command technology, offering even easier control of all home devices. This is not just a ‘cool’ gadget, but something that will become a mainstay of home control system installations. At a time when technology is offering so many opportunities to enrich and simplify ones daily life, it is clear that technology is moving into the house. For more insight into the options available see your La Scala Integrated Media representative. As a Technologist, we design, build, program and service our clients’ connected homes, ensuring seamless compatibility of systems across the platforms for an easy and intuitive user experience. We’ve been positioning our clients for this over the past several years noting that a pantry full of ingredients does not make a master chef. It’s the art, the science, of pulling those ingredients together. At LaScala, we make your home comfortable, safe, productive, convenient, entertaining and beautiful. We partner with you, exploring your wants and needs, developing a technology strategy that will grow with you and your family. We stay current on emerging technologies and inform you of your myriad choices. We stand by you through the years, offering valuable service coverage to keep your systems running efficiently, effectively, trouble and worry-free. We make life simpler. Our extensive training and years of experience in this evolving field have allowed us to foster valuable partnerships with design professionals and adjacent trades. From inception to implementation, we work with an outstanding team of architects, interior designers, builders, landscape architects, plumbers and electricians, managing all aspects of your home project. We communicate the aesthetic and technical requirements of your connected home and make sure provisions are made for future needs. From the simple to the sophisticated, we strive to be your go-to resource for all things technology, your trusted technology partner, the Technologist. The holidays are around the corner! Soon our homes will be filled with festive decorations, mouthwatering scents wafting from the kitchen and guests to entertain! Whether you’ve been thinking about sprucing things up before your guests arrive or simply want to make some comfortable home improvements that will add to your holiday merriment, here are some things you may wish to consider. Nothing says “Welcome” quite like lighting design. From the moment your guests turn the corner, they’ll see your beautifully lit landscape and inviting walkway. Highlighted artwork and the soft glow of a chandelier in your foyer make a stunning first impression. Programmed lighting scenes can transform the mood at the touch of a button (or a simple “ask” of your voice control). An “Entertain” setting may turn your kitchen into a bustling center of activity full of food prep and laughter while lowering the downlights, sconces and chandelier in the dining room, setting the stage for the elegant evening meal. Following dinner the lights come back up to your “Clean-up” setting and your favorite holiday playlist ques up, drawing everyone to gather around the fireplace (also integrated into your Crestron home automation system). On milder evenings you may wish to entertain on your covered patio. Lighting scenes showcase architectural features, planters and fountains for added drama while highlighting uneven walking surfaces and stairs for comfort and safety. You and your guests can enjoy cozying up with your quilts around the firepit to watch your favorite holiday classics on a weatherproof TV or outdoor projection screen. If the weather outside is Vancouver “frightful”, bring the party indoors into an updated media room or dedicated home theater. We’ll help you plan the perfect space with plenty of plush custom cinema seating for everyone! If you’re one who wants to share your joy and seek to become a “destination” (or the next viral video) by putting on an outdoor display that can be seen from space, you’ll need a sound system that’s worthy of the task. Those synchronized music and lighting displays are sophisticated but, if you have an integrated home automation system, we can get you in control and in “sync”! While the neighbors are out gawking at the lights and enjoying the orchestration, unless you have an infamous Leg Lamp prominently displayed in your front window you may want to add some beautiful motorized window shades. Automated shades can be integrated with your lighting scenes and come in an elegant array of weaves, styles and colors. They are the perfect solution for hard to reach floor-to-ceiling windows in voluminous rooms and can be on separate settings. They’re also great for blacking out light in areas for TV viewing and are available for custom installations over skylights, stairway/foyer accent windows, etc. Check out this beautiful guide outlining the Top 10 Reasons to Add Crestron Lighting & Shades to Your Home for some great design ideas. While preparing your guest rooms, imagine offering them the luxury of automation. Easy-to-read and use touch panels, keypads and hand-held remotes that control lighting, fans, fireplaces and more in their room add elegance and enjoyment to their stay. While we’re off dreaming of sugar plums, others are up to Grinch-like behavior scheming to steal the joy from our celebration. Yes, sadly, according to the FBI, nearly 400,000 homes are burglarized during November and December each year. Burglars are opportunists and will move to an easier score when a few simple deterrents are in place. Strong, automated door locks will keep them out while allowing you the ability to “buzz” your family and friends in if you’re caught in holiday traffic. And nothing says “we’re home” like well-timed automated indoor and exterior lighting. And your lighting control can be integrated with your home security system for even greater peace of mind. So give us a call and let us help you prepare for the holidays! We’ll put together the perfect system for you. All you need to do is create your holiday playlist, address your invitations and start shopping! Shopping? Oh yeah, we’ve got you covered there too! Stay tuned for our gift giving guide. We’ll help you find something for every tech-enthusiast on your list! Technologies for today’s homes and offices are sleek, contemporary and elegant. Some elements, such as touch panels, custom-framed displays and speakers that look as incredible as they sound, are meant to be seen. But then there’s the behind-the-scenes components; the receivers, amplifiers, switchers…all the things with the blinking lights and knobs that you choose to either showcase or hide away. Either way, they all “live” somewhere and that somewhere has specific requirements. Technology systems are comprised of various electronic components that require power and, inherently, produce heat. Like your laptop or other electronic devices, they need proper ventilation for reliable, peak performance. Not all furniture is suitable to store electronics. Choices for housing audio video gear are numerous and offer clever solutions for providing air-flow, managing cables and allowing IR signal visibility when required. Regardless of whether your components are stored in an equipment rack in an out-of-the-way storage closet or front-and-center in a media cabinet or credenza, purpose-built AV furniture will provide these critical features. AV equipment racks are available in various heights, measured in rack spaces or units, depending on the requirement of the components. They can be installed inside of a media cabinet, on a wall using a swing-out mount or placed on casters for ease of accessibility when servicing. 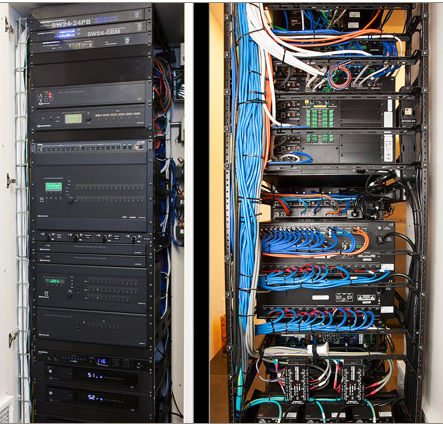 For extensive whole-house or integrated commercial systems, multiple racks may be required. Racks can be placed in the room or located in an off-area such as a centrally located, climate-controlled closet. Some installations will require forced ventilation through the use of thermostatic rack fans that will draw heat from the gear. When gear is stored in an enclosed unit, it is imperative that air be allowed to flow so that the heat can adequately dissipate. The beauty of an integrated system is, well, that it’s integrated; all the systems “talk” to each other. Talking equals connectivity and connectivity equals cabling and cords, including wireless solutions. While wireless gear and speakers offer elegant, wire-free signal, electronics still require power. 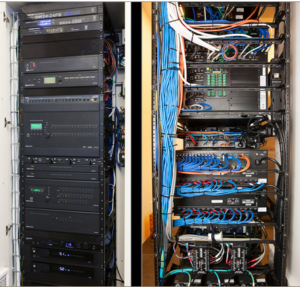 AV furniture provides access to the components as well as rack “rails” or channels to attractively conceal or “manage” the wiring. Once the cabling leaves the rack or unit, the best path for wire runs needs to be determined, along with factoring in the length of the run and calculating conduit specifications. This is where LaScala shines. We’ve got the tools and know-how to get cables from Point A to Point B with minimal impact and while factoring in future demands and incorporating those unattractive wires into an aesthetically pleasing (or even invisible) design. Depth is also a consideration when placing components. In addition to allowing some space for airflow, connecters and cables add to the depth required for the back of the gear. At a minimum, plan for a depth of 20”. Knobs and control access are also a factor for various reasons. First, units with doors need suitable clearance to close properly. Second, if the system is IR-controlled, a clear line-of-sight must be established otherwise an IR distribution system will be required. Gaming consoles and media storage present additional considerations. With all that processing going on, game consoles give off considerably more heat than AV equipment and, while they are RF (radio frequency which does not require sightline) allowing for entertainment unit doors to remain closed, gamers still need convenient access to the unit to charge their controllers. And, even though it seems the thing to do, Media should be stored separately from electronic equipment so the heat does not affect the digital content. While audio video racks and entertainment units are available in a wide variety of sizes and styles, custom units are often desired. Some people embrace the high-tech electronics and incorporate the sophisticated gear into the room’s design through custom-framed racks that face the interior. We love this approach but advise that they be installed at the back of room so as not to be a distraction while viewing an LED display or projection screen. Another popular solution is that of the “floating” shelves or enclosed media unit. These units are bracketed to the wall without a base as if they are hovering above the floor. For any of your custom work, we can provide you or your interior design professional with detailed drawings and/or dimensions for millwork. We will also communicate with your electrician or other trade where power drops need to be located. Form and Function are One! Today’s purpose-built AV furniture – credenzas, entertainment centers and glass étagères -will offer proper ventilation, accessibility to components and elegant wire management. We’ll determine the space requirements and share with you and your designer a variety of elegant choices or, when a custom solution is desired, provide the details needed to create the perfect solution for your home or office technology. We’ve recently talked about getting together to assess your home’s technology systems. It’s always a good idea to make sure you’re abreast of the latest technologies available and how to implement new devices both now and in the near future. The other key to satisfaction with your technology systems is ensuring their technical health. Simple things, such as cleaning components in the equipment rack, go a long way in preventing equipment from overheating. Part 2 of our annual Tech-Up addresses the advantages in having a preventative maintenance plan that would include a visit from one of our technicians. While everything may be running smoothly, it’s possible you’re due for a firmware or software update that could potentially activate new, desirable features. We’ll put your network and systems through a thorough test to ensure functionality and make necessary security updates. We’ll also check to make sure everything is properly connected to your network, preventing trouble down the road. We suggest you make a note of any questions you’d like to ask during the service call and be sure to advise us of any new devices, features or systems you’re interested in learning about or adding. To optimize your enjoyment and satisfaction and to prolong the life of your system we offer our LaScala Client Care Plan. The Plans offer proactive monitoring and maintenance of your systems. Our goal is zero system downtime and 100% client satisfaction. We understand that from time-to-time, equipment will fail. The goal of our Plans is to be able to discover problems before they occur. Thorough check of network, AV and Smart Home systems, testing each system through a complete operational check to ensure functionality. Firmware, software and security updates installed as needed. Minor programming and personalization improvements. Your home technology is a part of your everyday life. We want you and your family to get the most out of it and we want you to know we’re here to help. We’d love to hear from you – please call or email us with any questions or to schedule your maintenance visit today! The transition to fall brings many changes; mild temps that have us rushing outdoors to enjoy fall festivals and food trucks, our beautiful Vancouver bursting with color (plan a trip to VanDusen Botanical Garden! ), the onslaught of pumpkin-flavored everythings…and the slew of marketing messages stuffed into your bills suggesting it’s time to review your policies! Just like your homeowner’s policy, auto coverage and health insurance are affected by the change in seasons and life events, your home’s technology systems may benefit from an annual assessment too. Imagine all of the devices connected to your personal “internet of things.” How many of those devices have been added since your network was initially set-up? A network upgrade may yield a remarkable difference in your system’s performance. And of those new devices, how many were added to your home media system? Are you getting optimal image and sound quality? And how are they controlled? Some minor programming tweaks could go a long way in how your family uses and enjoys your home’s technology. As a CEDIA professional, we recommend an annual “tech-up”, a comprehensive assessment of your home’s technology systems to ensure your system’s “health” and to gauge how happy you are with it and what it provides. We all know how fast time flies and, in “tech” years, that’s “amplified” even more. If it’s been a year, or 3 or 5 since your system was installed, chances are you’re not taking advantage of all it has to offer. Let’s set aside an hour to just sit down and talk about how you use your home’s systems. We’ll talk through all of your technology questions; what can my new Apple watch do? How do I set up Alexa to control my automated shades and lighting? Is my media room 4K ready? How do I integrate CDs onto a new platform? Can my new gaming console be integrated onto my remote control so I can stream movies? There’s nothing we love more than to talk tech! Let’s get all your questions answered….maybe even some you hadn’t thought of! We’ll explore your existing system demands. Maybe you added new users to your network or are working from home. And we’ll determine if there are any upgrades available that could maximize performance or add features. We can also address anything you’re currently wanting to add or change and, together, develop a strategy for implementing NextGen technologies. It’s an exciting time in the home automation industry. Systems are integrating more elegantly and efficiently than ever before and voice commands are at the center of it all. Art and technology are truly fusing to create innovative, sophisticated forms of concealment and google and Apple continue to influence everything that touches tech. We’ve got lots to talk about! Like prepping for any valuable appointment, as your technologist we suggest you start of list of things you’d like to discuss during our visit so that we get the full picture of your technology needs. Do a quick walk-through and think about how adding or tweaking a feature could be beneficial. Write down your questions, what you’ve added to your system and what you want to add! Your home’s technology is a part of your everyday life and we appreciate you entrusting us with its care. Please know we’re here to answer your technology questions and help you make the most out of your systems, now and for years to come. Call now and schedule your annual Tech-up! We welcome the opportunity to reconnect. And be sure to check back soon. We’ll discuss optimizing your system’s health through a comprehensive preventative maintenance program that takes the worries out of everything from changing batteries in the smoke detector to checking for firmware updates. Stay tuned! When coming home from a long day at work, the last thing you want to encounter when you walk in the door is a wall of various wall plates, switches and knobs – all of different sizes, shapes and functions. This “wall acne” is not only inconvenient and confusing, it’s often a serious design obstacle in many homes. Thankfully, recent technological advances in home automation have brought sleek, stylish and sophisticated back. Imagine combining all of your many controls in your entry way, by the garage door, or in your bedroom using one seamless keypad, instead of a mash up of random buttons and switches. This new, design-forward approach to technology synthesizes your lighting and temperature control, security and entertainment systems, and even your garage door opener into one user-friendly interface – reflecting the current trend in minimalism and ease-of-use. It doesn’t stop at just convenience and style. This new home automation can help you improve your energy usage by automatically adjusting the temperature or lighting and shade control, depending on the weather or the amount of people in the room. Your home automation tech specialists can help you design the right system to clear up your acne and reveal clean, smooth walls.